Snozone Members, simply log into your online account and automatically receive your 25% discount. Snozone Milton Keynes and Castleford are outstanding venues to learn how to ski. We have the best quality snow, excellent equipment and expert BASI qualified coaches who will teach you in a safe, welcoming environment. You can choose to learn in a group or privately – at a pace that completely suits you. We have a number of different lesson options to choose from below (juniors are from 3-15yrs). The hire of your skis, helmet and boots are all included in the ticket price. Ski lessons are also a brilliant gym alternative! Are you tired of the same old workout and considering ditching your gym membership? Maybe it’s time you tried learning to ski. Everyone can learn to ski! We believe snow sports should be available for everyone, so for those with additional needs we also offer adaptive lessons on a private one-to-one basis delivered by Snozone Disability Snow sports. Prices start from £39.99pp. Once you have completed your lessons, join us for further coaching or main slope practice. Find more details on our slope passes and coaching page. Snozone’s ‘Summer of Excellence’ is nearly upon us. Launching on the 27th April, we are excited to reveal the prices of private lessons, which have been massively reduced to help skier’s and snowboarders of every level develop their skills and technique over the summer and find their peak performance! As a result, we have made private lessons the same price as group tuition – You will now be getting 8 times the value from every visit! Private lessons focus is 1:1 and therefore the entire lesson is tailored to you. 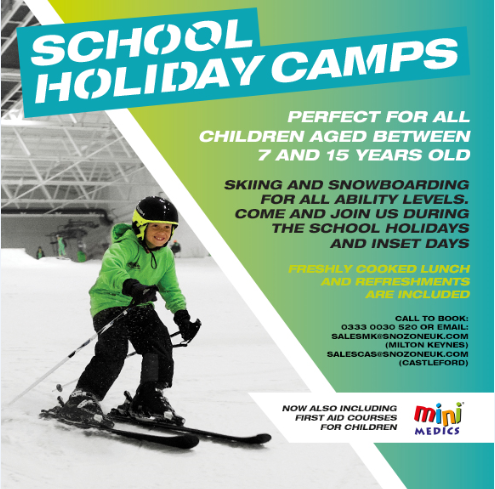 Achieve your goals in a bespoke and safer setting, whether it be fitness for the summer holidays, honing skills or just simply having fun on real snow this summer. Intermediate and advanced skiers/snowboarders will benefit from private coaching – which can be delivered on the main slope and can include features such as moguls and freestyle. So much more than just an experience day, at Snozone you will learn a skill for life! A one day course lasting up to 7.5 hours (including breaks throughout the day). Our expert coaches will guide you through all the basic skills including how to turn and give you an introduction to steeper slopes – the equivalent of a blue run in resort. Skills attained may be dependent on your personal rate of progression or that of others in your group and it is very important that we don’t over-accelerate your learning before you’re ready to move to the next level. This lesson is physically demanding so be prepared to be thoroughly exercised! Adults only (16 years+). Our expert coaches will guide you through all the basic skills including how to turn and give you an introduction to steeper slopes – the equivalent of a blue run in resort. A one day course (7.5 hours including refreshment breaks) for skiers who have just learned to ski, who find themselves stuck in a snow plough, or who are coming back to skiing after a long time away. This lesson will improve skiers technique and understanding of how fitness, warming up, balance, posture and control of skis all contribute to very effective parallel skiing. You will be skiing confidently by the end of the day and ready for the mountain! A full day course (7.5 hours including refreshment breaks) for those who want to take their first steps into freestyle. This is for skiers who can confidently descend the main slope indoors, or on blue runs outdoors. You must be able to control your speed and direction through turns and show good balance and posture. You will be introduced to boxes and kickers and learn 180 grabs as well as confidently mastering flat land freestyle. Each session lasts 3 hours (2 hours for 11-15 years) including refreshments breaks. Taking level 1 & 2 from our development structure, this allows our guests to be involved in the learning process for a longer and more concentrated period of time, taking you almost half way through the lesson path. Your confidence will increase as will your longer term progression and importantly your enjoyment of snowsports! You should then book your next combined lessons at the end of the tuition, to ensure your progression continues, consistently. Our guests recommend the combined lesson as the best and most rewarding way to learn how to ski. Our expert team will endeavour to deliver all the skills listed for each level, however skills attained may be dependent on your personal rate of progression or that of others in your group and it is very important that we don’t over-accelerate your learning before you’re ready to move to the next level. If you’re not ready to move to level 2 from level 1 on the day and need to rebook a lesson for some additional coaching, we offer a 15% discount for bookings made on the same day as your original lesson. Taking levels 2 & 3 from our development structure, you will learn how to change direction using the “snowplough turn” and will be turning with great confidence by the end of the session. You should book your next lesson straight away to continue your learning. Our guests recommend the combined lesson as the best route to take to becoming a skier! Our expert team will endeavour to deliver all the skills listed for each lesson stage, however skills attained may be dependent on your personal rate of progression or that of others in your group and it is very important that we don’t over-accelerate your learning before you’re ready to move to the next level. If you’re not ready to move to level 3 from level 2 on the day and need to rebook a lesson for some additional coaching, we offer a 15% discount for bookings made on the same day as your original lesson. Taking in levels 3 & 4 from our development structure, you will learn how to link your turns with greater coordination and balance. You should book your next lesson straight away to continue your learning. Our guests recommend the combined lesson as the most rewarding. You will be skiing with good rhythm and coordination by the end of the session. Our expert team will endeavour to deliver all the skills listed for each lesson stage, however skills attained may be dependent on your personal rate of progression or that of others in your group and it is very important that we don’t over-accelerate your learning before you’re ready to move to the next level. If you’re not ready to love to level 4 from level 3 on the day and need to rebook a lesson for some additional coaching, we offer a 15% discount for bookings made on the same day as your original lesson. Taking in levels 4 & 5 from our development structure, you will improve your speed control through linked turns on steeper terrain and start to progress towards parallel skiing, matching the skis towards the end of each turn. Our expert team will endeavour to deliver all the skills listed for each lesson stage, however skills attained may be dependent on your personal rate of progression or that of others in your group and it is very important that we don’t over-accelerate your learning before you’re ready to move to the next level. If you’re not ready to move to level 5 from level 4 on the day and need to rebook a lesson for some additional coaching, we offer a 15% discount for bookings made on the same day as your original lesson. Our guests recommend this combined lesson as the best way to finish the basic learning process and gaining access to the main slopes as you’ll be skiing with great proficiency! Taking in levels 5 & 6 from our development structure this is a perfect lesson to further develop your ski technique and by the end of level 6 you should be ‘parallel skiing’ on steeper terrain. Our expert team will endeavour to deliver all the skills listed for each lesson stage, however skills attained may be dependent on your personal rate of progression or that of others in your group and it is very important that we don’t over-accelerate your learning before you’re ready to move to the next level. If you’re not ready to move to level 6 from level 5 on the day and need to rebook a lesson for some additional coaching, we offer a 15% discount for bookings made on the same day as your original lesson. Limited Availability – £99 Private Family Lessons – Available until the end of April, minimum one adult and maximum two adults – up to four attendees per lesson. Please call us on 0333 0030 520 to book. Private lessons are our most popular way to learn with a coach dedicated just for you or your group. Our expert coaches will tailor the tuition to your needs – learn as an individual, in a group or with your family. We do recommend however, that children learn through the SnoAcademy, our industry leading term time club for children aged 3-15. It’s a great way for your child to perfect their skills and gain confidence in a group environment – and make some new friends too! Adult (16 yrs+) 1hr £149.99, Additional adult £39.99 (weekend/ peak holiday). 1hr £99.99 , Additional adult £39.99 (Mon-Fri). Family (2 adults & 2 juniors or 1 adult & 3 juniors) 1h £199.99 (weekend/ peak holiday), 1hr £175.99 (Mon-Fri). Juniors (3-15 yrs) 1hr £116.99 Additional junior £39.99 (weekend/ peak holiday). 1hr £96.99 (Mon-Fri) Additional junior £39.99 (weekend/ peak holiday) *Maximum of 2 juniors in the lesson. Private Academy Intro 30 minutes £51.99 (weekend/ peak holiday), £49.99 (Mon-Fri). Please note: If you would like to book more than 1 private lesson, please book this separately. This lesson is perfect for a child that has never skied before or who wants to develop their skills and increase confidence with more time on the slopes. Providing one to one tuition with one of our expert coaches, who will tailor the tuition to your child’s needs. For further details and availability please call our friendly bookings team on 0333 0030520. A 90 minute learn to ski experience which includes a full hour of tuition on our real snow slope, with a 15 minute briefing before and a 15 minute debriefing afterwards. You will learn posture & positioning on the skis and how to control your speed. When you are ready we recommend taking our lesson 2 almost immediately which will introduce you to turning. (Juniors: 11-15 years). Within 90 minutes (adults, which includes a full hour of tuition on our real snow slope, with a 15 minute briefing before and a 15 minute debriefing afterwards) or 60 minutes (juniors 11- 15 years) of our lesson 2 you’ll learn how to slide down the hill in a controlled manner from a steeper gradient and you’ll then learn how to make changes of direction in preparation for skiing on the main slope. When you are ready, we recommend taking our lesson 3 almost immediately where you will continue to perfect your turns. This 90 minute lesson for adults (which includes a full hour of tuition on our real snow slope, with a 15 minute briefing before and a 15 minute debriefing afterwards) or 60 minute lesson for juniors (11-15 years) is ideal for someone who has completed lesson 2 or who is keen to return to skiing after a break from the sport. Our coaches will help you to make turns around cones placed in a straight line, using a smaller snowplough and offset markers. You will also learn to use the poma lift. When you feel confident we would recommend moving onto lesson 4 to take your skills onto a steeper part of the slope. During the 90 minutes (for adults which includes a full hour of tuition on our real snow slope, with a 15 minute briefing before and a 15 minute debriefing afterwards) or 60 minutes (for juniors 11- 15 years) of lesson 4 we will take you on the steeper part of the slope to further develop your balance and turns. This lesson is for someone who feels confident turning from halfway up the main slope and is ready to try their skills on an even steeper gradient. This 90 minute (for adults, which includes a full hour of tuition on our real snow slope, with a 15 minute briefing before and a 15 minute debriefing afterwards) or 60 minute (for juniors 11- 15 years) lesson is designed to further increase control through the matching of skis towards the end of the turn (plough parallel). This 90 minute (for adults, which includes a full hour of tuition on our real snow slope, with a 15 minute briefing before and a 15 minute debriefing afterwards) or 60 minute (for juniors 11- 15 years) lesson is designed to further increase control through steering the skis progressively earlier in the turn, in unison rather than sequentially, to form a basic parallel turn. Experience moguls on specific Sunday and Mondays each month with coaching on the same day at Castleford and on Monday’s at Milton Keynes. To use the moguls without coaching please buy a standard main slope pass at any time during the day or evening, you can train and practice to become a true all terrain skier! Coaching is available on the Sunday evenings at Castleford and on Monday evenings at Milton Keynes, please pre-book to avoid disappointment. At Milton Keynes- Monday 3 hour coaching session from 7-10pm. Please click on the Milton Keynes button to book online. At Castleford- Sunday 3 hour coaching session from 6-9pm. Please click on the Castleford button to book online. Make great progression in your snowsport with our weekly two hour training sessions covering specific gates and drills. Milton Keynes – every Tuesday 7-9pm; Castleford – every Wednesday 7-9pm and every Saturday 3.30pm-5.30pm. Try the Snozone Orbit at Castleford, a wide revolving indoor dry slope for dedicated 1-2-1 coaching. The 45 minute private lesson is ideal for beginners or people wishing to perfect their skills. With no lifts and no queues, the coach remains at your side throughout, tailoring the session to meet your needs. Video analysis is provided. It also provides a great 45 minute work out! To book please email enquiriescas@snozoneuk.com.